Exquisite is a great word! To me, if something is exquisite, it’s a treat for both the eyes and the other senses. In crochet, that means touch also. 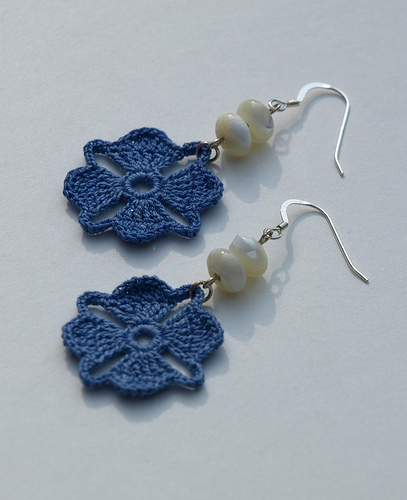 Margaret Maccio and Tuesday Bennett produce exquisite crocheted earrings and necklaces. 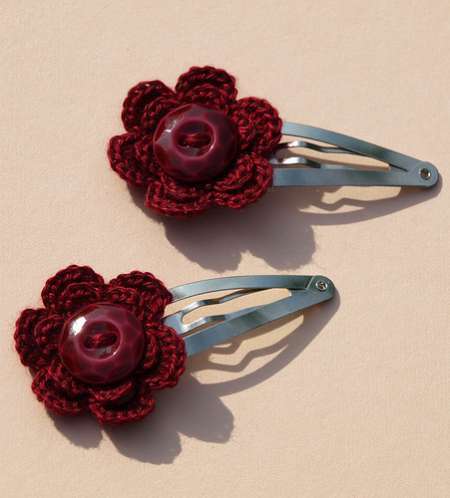 While their earrings are simply too long for my frame, they are absolutely perfect in color choice and stitchery. Each set of earrings is affixed to a silver (tone) hook and accented with a pretty bead (crystal). The motifs are perfect in shape and proportion. The matching necklaces, bracelets, and other small accessories are similarly styled. It’s easy to tell that these gals are perfectionists. I agree! I saw these pieces in person and they are unbelievable. Amazing work, ladies. I just love these girls their work is fantastic!!! And they are such sweethearts!!! Thanks for the feature on them!!! Aww, thanks so much for your kind words! We take a lot of care with every piece we create and it’s a joy to talk to people who appreciate it!